218 pages | 33 B/W Illus. 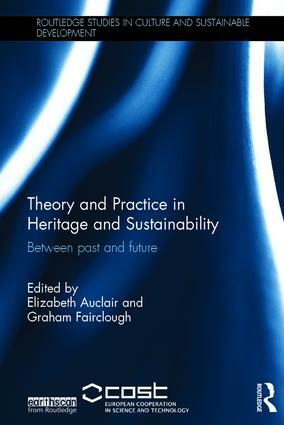 This book explores cultural sustainability and its relationships to heritage from a wide interdisciplinary perspective. By examining the interactions between people and communities in the places where they live it exemplifies the diverse ways in which a people-centred heritage builds identities and supports individual and collective memories. It encourages a view of heritage as a process that contributes through cultural sustainability to human well-being and socially- and culturally-sensitive policy. With theoretically-informed case studies from leading researchers, the book addresses both concepts and practice, in a range of places and contexts including landscape, townscape, museums, industrial sites, every day heritage, ‘ordinary’ places and the local scene, and even UNESCO-designated sites. The contributors, most of whom, like the editors, were members of the COST Action ‘Investigating Cultural Sustainability’, demonstrate in a cohesive way how the cultural values that people attach to place are enmeshed with issues of memory, identity and aspiration and how they therefore stand at the centre of sustainability discourse and practice. The cases are drawn from many parts of Europe, but notably from the Baltic, and central and south-eastern Europe, regions with distinctive recent histories and cultural approaches and heritage discourses that offer less well-known but transferable insights. They all illustrate the contribution that dealing with the inheritance of the past can make to a full cultural engagement with sustainable development. The book provides an introductory framework to guide readers, and a concluding section that draws on the case studies to emphasise their transferability and specificity, and to outline the potential contribution of the examples to future research, practice and policy in cultural sustainability. This is a unique offering for postgraduate students, researchers and professionals interested in heritage management, governance and community participation and cultural sustainability. Elizabeth Auclair is Assistant Professor in the geography department at Cergy-Pontoise University, France, where she is director of a Master’s degree on cultural development and heritage valorization. Graham Fairclough is a Principal Research Associate in the McCord Centre for Historic and Cultural Landscape in Newcastle University, UK, having previously worked for English Heritage (one of the UK’s national heritage agencies) and its predecessors until 2012.